Front: 10 Diet Rules You've Never Thought of! 1. 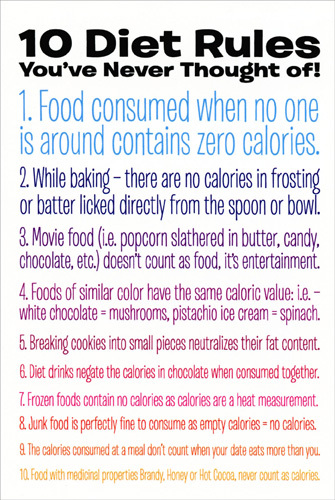 Food consumed when no one is around contains zero calories. 2. While baking - there are no calories in frosting or batter licked directly from the spoon or bowl. 3. Movie food (i.e. popcorn slathered in butter, candy, chocolate, etc.) doesn't count as food, it's entertainment. 4. Foods of similar color have the same caloric value: ie - white chocolate = mushrooms, pistachio ice cream = spinach. 5. Breaking cookies into small pieces neutrilizes their fat content. 6. Diet drinks negate the calories in chocolate when consumed together. 7. Frozen foods contain no calories as calories are a heat measurement. 8. Junk food is perfectly fine to consume as empty calories = no calories. 9. The calories consumed at a meal don't count when your date eats more than you. 10. Food with medicinal properties Brandy, Honey or Hot Cocoa, never count as calories. 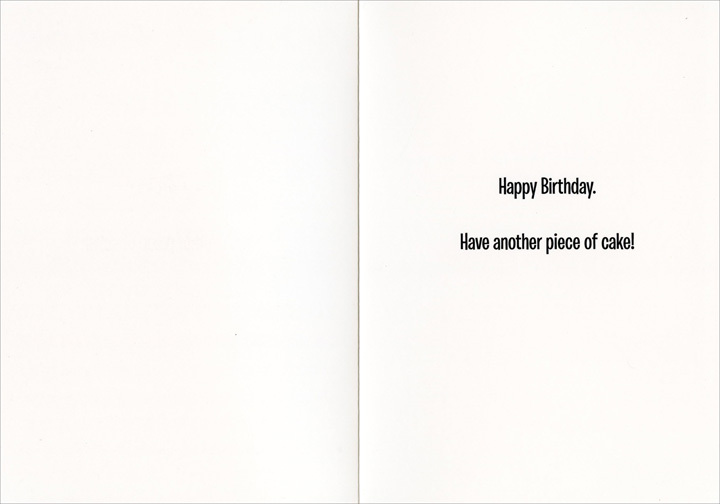 Inside: Happy Birthday. Have another piece of cake!